The safety of the Cumberland Valley School District students is our utmost concern. Please review these bus safety tips with your child as needed to ensure a safe, pleasant ride to and from school. · Have your child at the stop at least 5 minutes before the scheduled pick-up time. · Students should stand at least 10 feet back from the curb. 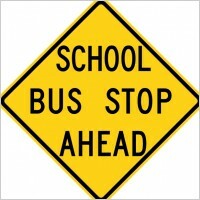 · Students should not approach the bus until it comes to a complete stop. · Be Aware – Cross With Care! Wait until the school bus has stopped all traffic before stepping out onto the road. · Remember to look BOTH ways before crossing the road to board the bus. · Students should use the handrail when boarding and departing the bus. · Students should take their assigned seats quickly and remain seated during the ride. · Students should not put any portion of their body out the bus windows. · Students should not eat or drink while on the bus. · If students talk, they should speak quietly so as not to distract the school bus driver. · Students should never walk in the Danger Zone – the 10 feet surrounding the bus. If they have to cross in front of the bus, they should be able to see the driver’s face. · Once off the bus, students should never run back to the bus, even if they have forgotten something. Working together, we can make your child’s commute a safe and enjoyable experience.